It is one of those strange ironies that, while Houston is considered the archetype of the modern city, its construction barely a faded memory, a good many individuals who actually built it remain anonymous. 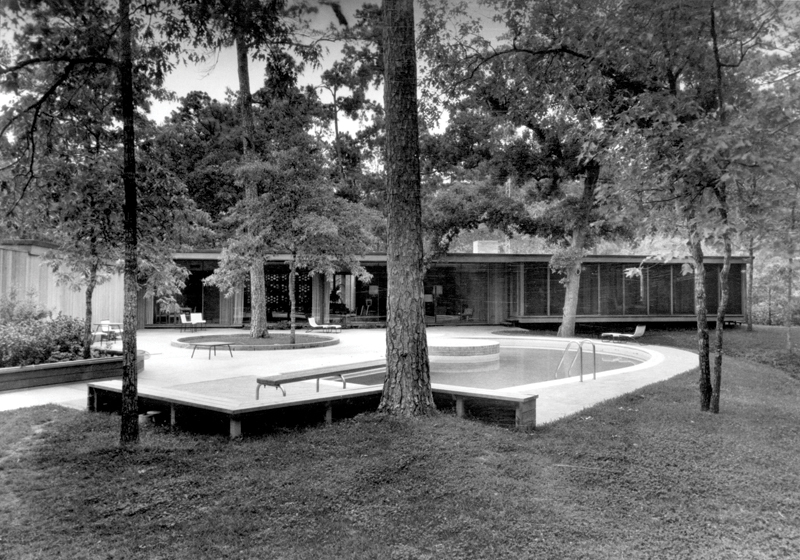 Oh yes, there are the famous buildings by imported stars like Philip Johnson and I. M. Pei, but it has been locals who have truly defined the place, and none more than Arthur Evan Jones, a Houston native whose work is a good deal more distinctive than his rather forgettable name. A new monograph on Jones and Lloyd Morgan Jones, the firm he led for much of the second half of the 20th century, should go some way toward elevating his profile. 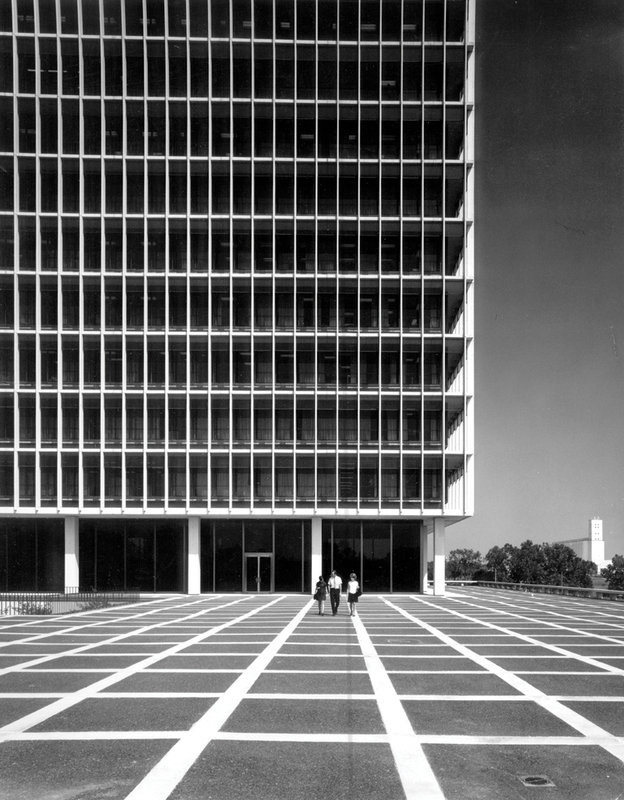 Written by the Houston architect and critic Ben Koush, AIA, it is part of a series produced by the nonprofit Houston Mod that has shed light on underappreciated local architects, including Donald Barthelme, Hugo V. Neuhaus Jr., and William R. Jenkins. Jones was a developer’s architect, and here Koush perceptively speculates that one reason for his relative anonymity could be the fact that his principal clients were Jewish in an anti-Semitic age. 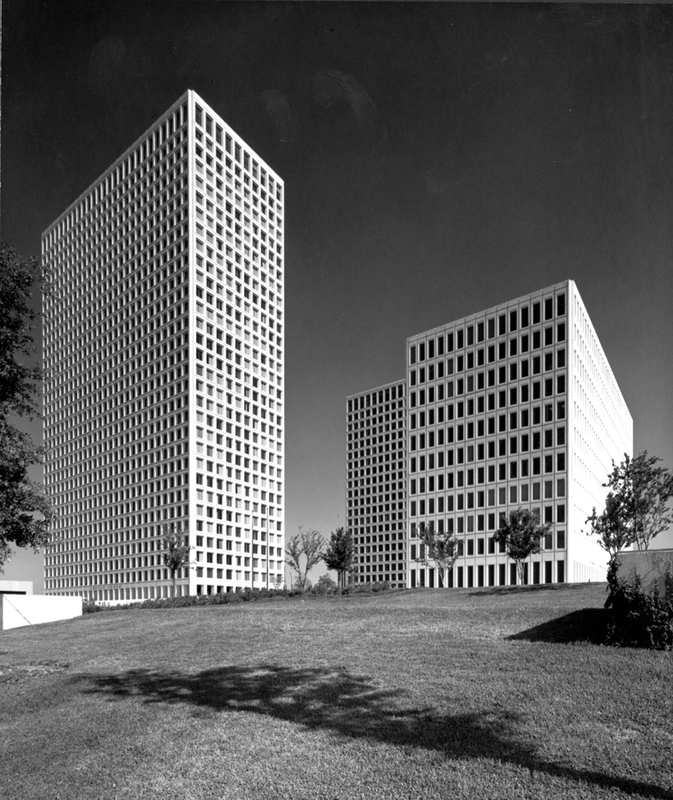 Among those patrons was Melvin A. Silverman, who, with partner Bennett Rose, commissioned Jones to design Houston’s first modern office tower. The Melrose Building (a portmanteau of the developers’ names) was completed in 1952, and established what would become a standard Houston typology: a tower marked by projecting sun shades that both shielded the interior from the blazing Texas sun and gave aesthetic definition to the exterior. But it was another Jewish developer, Kenneth Schnitzer, who would become the firm’s most prolific client, through his Century development firm. The relationship began with several smaller projects, and then in 1967, Schnitzer commissioned the 28-story Houston Natural Gas Building. A series of additional towers followed. Exactly which ones is a bit confusing, and here we get to one of the hiccups of this book. Essays at the beginning are dedicated to individual developers and typologies, which means there’s a lot of skipping around between names and buildings that have a tendency to blend together. And, while Koush can be an elegant writer and flat-out brilliant critic, the text here has a tendency to be burdened with leaden detail about Houston development. Indeed, the essay sections of the book seem undecided as to whether the focus should be on Jones or on a more general contextual examination of Houston’s growth. Not helping matters is the small type, which makes concentration even more difficult. Overlooking these missteps — and they are faults of admirable ambition as opposed to laziness — what emerges is the story of a designer and firm of prodigious ability and output. Under Jones’ direction, the company designed something on the order of 2,000 projects, across many scales and types: In addition to skyscrapers, projects include office parks, sports facilities, private homes, apartment buildings, master plans, and more. This idea is most effectively conveyed in the book’s projects section, set off handsomely on coated paper stock to better display an extensive collection of drawings and photographs. Here, we see the diversity of Jones’ work, as well as Koush’s deep knowledge and critical acumen. Less successful, at least urbanistically, was the firm’s Greenway Plaza development, a self-contained complex of gridded towers that exemplified Houston’s development into a multi-nodal city defined by automotive transit. As Koush would have it, Jones’ masterpiece is the 50-story Four Allen Center of 1984, a lozenge-shaped tower with a pristine wraparound facade of reflective glass offset by bands of white aluminum. No less an eminence than Arthur Drexler, then the chief architecture curator at New York’s Museum of Modern Art, called it “the most beautiful mirrored-glass building I have ever seen — absolutely staggering.” At the time, he had never even heard of Jones. With the publication of Koush’s book, one can only hope that this lack of recognition will be less of a problem. Mark Lamster is the architecture critic of the Dallas Morning News.